My first impulse is to try to tell you what Marwencol is about, and we’re all better off if I don’t begin that way; not only because it’s a difficult film experience to condense – and I don’t want to cheapen it by trying to convey what it is, because the documentary accomplishes so much – but I’d rather you see the film, because it demands to be taken on its own terms. Strictly speaking, it’s about Mark Hogancamp, the victim of a beating, who reconstructs his own life by assembling a scale version of a World War II tableau. But wait, as they used to say, there’s more. I’ve known Jeff Malmberg for a while – we worked together in a previous life – and his fascination with eschewing conventional narrative is not just some kneejerk thing for him. The films we’ve talked about when we’ve run into each other, as well as the documentaries he’s worked on as an editor, succeed through an anecdotal attack. Marwencol falls into the group of films he’s worked on and those we’ve discussed because his feature directorial debut has a similar casual power; each piece builds into an emotional narrative. All of the pieces – the greater social realities as well as Mark’s own rather complicated personal history – connect in ways that have more of an impact because it’s obvious that Jeff has lived with the material not only in filming it, but in its editing, as well. We not only get to know Mark Hogancamp, but Jeff, too. There are so many strands in Mark’s story that the easiest way to get it across would have been to lay out each segment, end to end, and then explain what it is we’ve just seen; we’ve all suffered through that doc. But Jeff chose to braid the psychological and expositional threads so that Marwencol is gorgeously interwoven. For Jeff, that’s not just the discipline; his own particular bent towards an emotional recounting rather than a straightforward one is a matter of temperament. Jeff’s simply built that way, and part of the entry point into the film for us is the idea that the director/editor is finding the film as he burrows deeper into the information he’s assembled; he realizes that when his curiosity is aroused, it leads to a piquing of our interest. Marwencol doesn’t try to sell or dazzle with an exhibitionism that keeps us at a distance, as documentary filmmakers sometimes do when they sweat to make their works feel like a fiction film, an attempt to separate their efforts from the onslaught of documentaries in the last decade. Jeff Malmberg made this film distinctive through an odd intersection of two fields that often combat each other – directing and editing. The editor is the first real audience member to see a film, and he has to pull it from the realm of the abstract into something that makes a viewer respond. 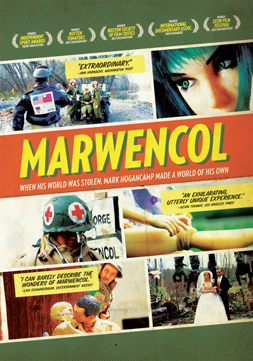 Which brings me back to defining Marwencol I think it’s about a man who goes through a life-changing event and becomes an artist as a result. And I think it’s what happens to Jeff Malmberg, too. You’ll see.